Hudson was born on October 3rd 2012 at Meute d'Asterion breeding (Mrs MILLESECK-FINCK). He is a dog with a serious model. A good construction, a beautiful mouvement of the arm. 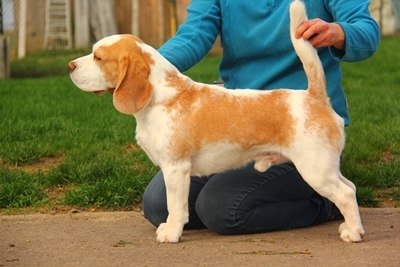 And, it's really important for us, he has an typical Beagle's expression. Hudson really appeals in the ring. Hudson is available for mating in other breeding. He has a lot of puppies who go on show with success all around the world. He obtains a natural aptitude test during the hunting's brevet at La Maxe (France) on September 11th 2016.